We are very excited to be able to offer the new Summer Spice™ series of Hardy Hibiscus for 2019! This series offers never before seen colors of these perennial Hibiscus in blue and true purple hues as well as other colors and all offer a tidy compact 3’ x 3’ habit with deep green foliage. These Hibiscus were developed through years of breeding, trials, and selection by the Texas A&M AgriLife Extension and the Texas Foundation Seed Service and are being marketed and produced by J. Berry Nursery of Grand Saline, Texas. The Summer Spice™ Hardy Hibiscus series and J. Berry Nursery were awarded the Reader's Choice & Editor's Choice Medals of Excellence by Greenhouse Grower Magazine. Clockwise from the top right: Bleu Brulee™, Crème de la Crème™, Cordon Bleu™, and Plum Flambe™. Images courtesy of J. Berry Nursery, all rights reserved. Hardy Hibiscus, a.k.a. 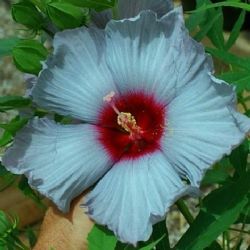 Perennial Hibiscus, produce some of the largest flowers found in gardens and landscapes and some of the earliest selections were known as ‘Dinner Plate’ Hibiscus and for good reason as some cultivars can have flowers 12 inches or more across. These perennials were originally bred from our native Marsh Mallow species (Hibiscus moscheutos, H. grandiflora, H. coccinea, etc…) but today they have added other Hibiscus species and cultivars in the mix to be able to develop plants with blues, purples, and even orange flowers. The colorful show begins in late spring and early summer and can continue until first frost with these Hibiscus. In mid to late fall and winter the stems turn brown as the plant enters dormancy. Hardy Hibiscus always seem slow to emerge in spring and are one of the last summer flowering plants to show up in the garden. Be patient with them as they are simply trying to avoid being bit by a late freeze or hardy frost. The flowers of Hardy Hibiscus attract a variety of pollinators including but not limited to butterflies, bees, and hummingbirds. The foliage of the Marsh Mallow, Hibiscus moscheutos, may be used by over two dozen species of butterflies and this will likely carry over into at least some of these hybrids. Begin fertilizing as soon as you see new stems emerging from the crowns. A balanced slow release fertilizer, including types that contain trace elements, are recommended. The brown stems can be cut back just above any live green tissue (about 4-6” high) in late fall and winter. In our own gardens we may leave the stems through winter as they may provide some additional protection to the crown. In fall and winter mulch the crowns with a loose breathable but insulative mulch especially for newly planted plants (in all but zone 10) and in USDA Cold Hardiness zones 7 or 8 and colder. J. Berry Nursery also recommends that you plant the crown just below the soil line as this triggers the ‘eyes’ or stem buds at the base of the plant to develop quicker. This will likely also help to ensure winter hardiness in the colder portions of their range. The optimum planting time for Hardy Hibiscus is in about mid-spring just before or as the new growth is emerging until about mid-summer but dormant and containerized perennial Hibiscus can be planted any time of year. Select a site that gets a minimum of 4-6 hours of direct sunlight and full to mostly sunny conditions are preferred for the densest growth and maximum flower production. These Hibiscus are tolerant of a wide range of growing conditions from wet and boggy, to moist, to average moist soils as well as heavy clay soils. For the first year or two it will be a good idea to provide supplemental water during dry spells to aid in plant establishment. J. Berry Nursery also recommends pinching these Hibiscus once the new shoots are about 4-6” high, leaving 6-8 leaves below the pinch, to produce fuller, well-branched, and more compact plants. Outside of their hardiness zones these Hibiscus are easy to overwinter as container plants some gardeners and landscapers use them as summer annuals due to the fantastic show they put on and the massive traffic stopping flowers. Information and images for the Summer Spice™ Hibiscus series is provided by and credited to J. Berry Nursery, all rights reserved. 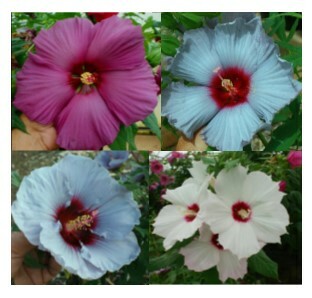 Visit their website, https://www.jberrynursery.com, for more information about these amazing new Hardy Hibiscus! 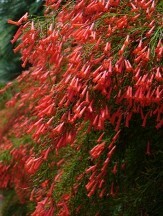 At Almost Eden we specialize in beautiful, unusual and hard to find plants including a large variety of native plants. 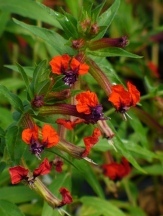 Our stock encompasses over 1000 varieties/species, spanning 100 different plant families for your home and garden. Our plants are live, growing and well-rooted plants often flowering or large enough to begin flowering when they are shipped with the soil and container intact. 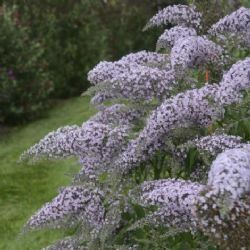 We have an excellent selection of plants for pollinators including plants for hummingbird gardens, butterfly gardens, plants that attract a variety of native bees as well as honey bees and even plants for hummingbird moths. We offer unusual and hard to find tropicals like the old fashioned types of free flowering Chinese Hibiscus, the intensely fragrant Night Blooming Jasmine, the true Jasmines and Night Blooming Cereus, as well as a variety of fragrant Angel's Trumpets and Epiphyllums (Orchid Cacti). 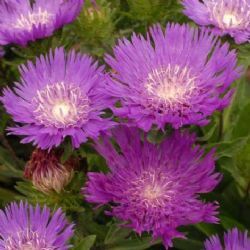 Each year we add more and more perennials from the tried and true heirlooms, to the easy to grow natives to some of the hottest new varieties out there! We grow a variety of shrubs including a large selection of Camellias as well as deciduous Azaleas, Hydrangeas, Butterfly Bushes and many more unusual and hard to find varieties. 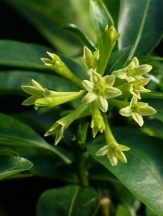 Vines include a selection of beautiful and intriguing Passion Flowers, Pipevines, Firecracker Vines, Coral Vines in 3 colors, Coral Honeysuckles, Climbing Roses and many more. Trees include many native species but our Crybaby Trees may be the most popular item on that list! John has a huge collection of figs and each year he works diligently to offer ever more varieties so check back often to see what's available. 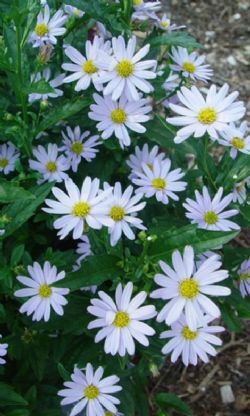 The plants that we currently have listed in our online catalog are all plants that we intend to offer in the 2019 season. There may be a few rare exceptions that remain on here for information purposes but we are working toward making those available in the coming seasons. To be notified, when an out of stock product becomes available again, go to the plant's individual product page by clicking the "Details & Growing Info" link OR by clicking on the plant's image in our online catalog. Just click the 'Email me when ready' link below the 'Out of Stock' notice and our system will send you a one-time automatic email letting you know the product is available. You do need to be registered and must be signed in to our website for this feature to work. This action does not add you to any other mailing lists. We do not share, sell or otherwise give out our customer's information nor will we send you loads of SPAM. If you are interested you are welcome to sign up to receive our periodic newsletter by clicking here. We understand what healthy quality plants should look like and our specially designed packaging system will get them from our greenhouse to your doorstep looking as though they were just plucked from the nursery. We ensure that your plants are secured safely in their soil and container. Our specially designed shipping and packaging system will get your plants to you quickly, carefully and easily via the US Postal Service Priority Mail to anywhere in the US. We will send an email stating when your order will ship and confirming the order information for verification. Please be sure to check your Spam or Junk mail if you don't hear from us within a day or two from when you placed your order. Orders are normally shipped on Mondays and Tuesdays (excluding holidays) of each week to ensure that your plants do not spend the weekend at the post office. Be sure to get your order and payment in by Friday at midnight, 12:00PM CST, for it to ship out the following Monday. See our Shipping info for more details. Tracking Your Shipment: We have recently upgraded our packaging system so that your shipping address is verified with the USPS prior to shipping and each package is automatically assigned a tracking number. The instant we print your shipping label you are immediately sent an email that includes your tracking number and a link to the USPS website where you can track your package until it arrives safely at your doorstep. We believe this will help to ensure that your plants get to you in a timely manner and in good condition. Your tracking email will originate from Stamps.com so please add "@stamps.com" to your whitelist so that your tracking email does not end up in your SPAM folder. Please feel free to rate any of the plants that you might have experience with as this can provide useful and insightful information for your fellow gardeners. We do review the reviews and so it may take time for your review to appear on our website. Please enjoy your stroll through our online catalog and if at anytime you have any questions or comments please feel free to contact us. Our office and customer service hours are open from 8AM-7PM CST daily. We are here most everyday so feel free to call us anytime during normal hours and John will do his best to answer your call.